Item Size: H-34", L-25", W-3"
Discover exciting ways to spruce up your home decor. Our unique decorative Frames are perfect for any style. Size: 2.5 x 2 feet. Inspired from Gujarat"s Kutch mud Art, with mirror work, This is a beautiful Centerpiece for your home, to showcase your beautiful memories. Material: Plywood base, Mirror work. Stunning photo frame with light in it photo will show with the light. It looks very beautiful. You can also use as mirror. 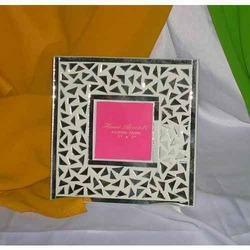 Glitter & Lac hand work items like photo frames, diaries, hand mirror, pocket mirror, key ring, pens, pen holder, pill boxes etc. good for gift and promotion, available as set or separate item. 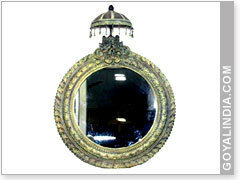 Photo and Mirror Frames We present our splendid range of photo frames. Our wooden photo frames are creative pieces of art that enhance the beauty of any room and are indeed expressions of one's aesthetic taste. This Photo Frame is more known as Magic Frame.